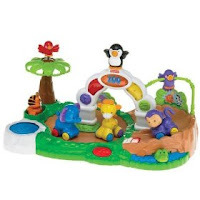 This little Fisher Price Amazing Animal Spinnin’ Animals Zoo is an ADORABLE toy. The center spins when the little animals slide down the ramp. I know it works because this is the exact toy my daughter got for her birthday a couple of months ago. It really is adorable! By the way – she just turned one (in case you aren’t sure about what age this will work for). You can save 60% off of the retail price right now at Amazon.com. It is marked down to $24.00. It does qualify for Free Super Saver Shipping, so pick up an inexpensive book (which also qualifies for free shipping) and you’ll have a great gift bundle to get that little cutie pie on your list!